Drive-In Rack and Drive-Thru Rack systems are a cost-effective solution to high-density storage. This static system has rails running the depth of the rack for pallet placement. The only limitation to the depth of pallet storage is the capability to drive deep within the system. The drive-in rack depth reduces the need for aisles and drastically increases cubed space utilization. Drive-In Rack loads and retrieves from the same side while Drive-Thru Rack loads from one side and retrieve from the opposite end. 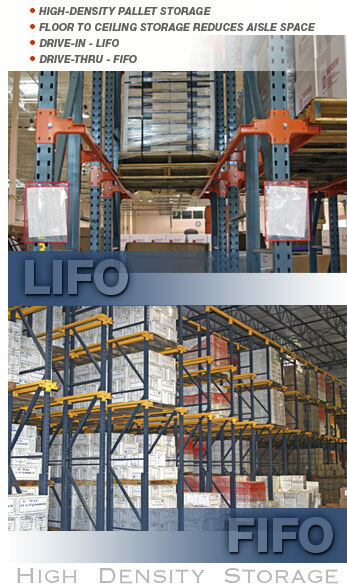 Drive-In Pallet Rack Systems load and retrieve from the same side, creating Last-In-First-Out (LIFO) inventory retrieval organization. Drive-Thru Pallet Rack Systems load from one side and unload from the other to create First-In-First-Out inventory retrieval (FIFO); forklifts can enter from either aisle. The rigidity of both pallet racking systems results from overhead bracing or being tied to the overhead structure. Drive-In rack systems provide low cost bulk storage along with guaranteed stock rotation. A Drive-In Rack System is an excellent option for freezers. Both Drive-In Rack and Drive-Thru Rack Systems are easy to install with simple support arms to hold rails and can be attached to standard pallet rack or special structural designs. UNARCO Engineering has specially designed sloped-leg frames to add extra clearance and safety for forklift movement within the aisles. This greatly reduces the risk of impact damage to front posts and allows drivers to swing loads as they exit the rack. Drive-In Rack and Drive-Thru Rack should be used for large volumes of like-product. Because of the high density storage, product is not easily accessible as pallets are stored floor to ceiling. However, dense storage can create space for up to seven times more product than floor stacking or three times more than pallet rack because pallets are stored back-to-back, floor-to-ceiling. A Drive-In Rack System requires close attention to pallet rack safety rules and a forklift driver’s initiative to report pallet rack damage to the Drive-In System. Because drivers must drive into the rack system there is increased potential for rack damage. For more information on Drive-in Rack and Drive-Thru Rack Systems view Drive-In/Drive-Thru Photo Gallery.